Find, quote, and bind more policies in a fraction of the time. We cut the friction out of commercial insurance. Bold Penguin is the highly efficient commercial insurance exchange that connects businesses, agents, and carriers to the right quote in record time. Directly access our exchange with a simple point-and-click graphic interface. Build your own powerful user interface on top of our Recommendation Engine. Use our dynamic filters for extremely granular targeting on types of risks. The future may be digital—but it is also human. We’re here to help agents write more commercial business with fewer touches, hurdles, or holdups. 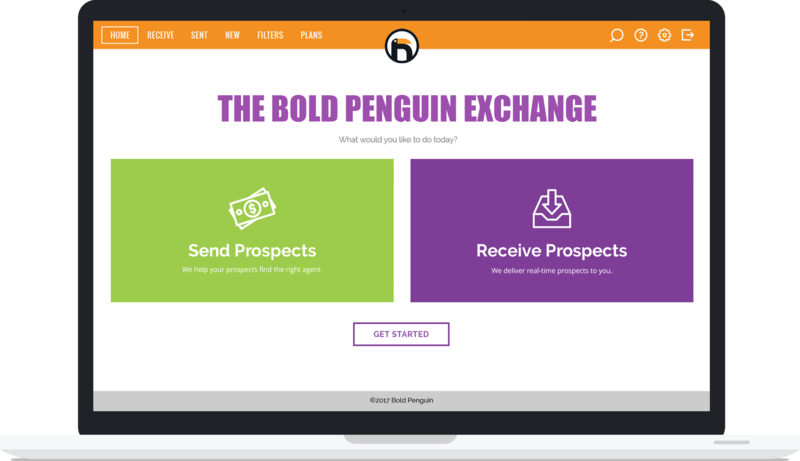 The Bold Penguin Exchange is powered by a Recommendation Engine that matches our agent partners with more of the right business prospects—streamlining your workflow to make small commercial faster, simpler, and more profitable. The Bold Penguin Exchange significantly reduces the time and cost of underwriting for our carrier partners, giving you prime placement in the categories you’re targeting, and matching you only with the risks that align with your strategy. Insurance agents, brokers and carriers: Write more commercial insurance. Everything from insurance agents to brokers, all in one place.